Grandmaster Nikita Vitiugov, one of the most promising Russian juniors and winner of the Russian Championship Higher League, has kindly accepted an interview with Chessdom. 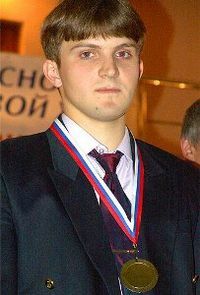 Besides the fantastic result at the Russian qualifier, Nikita was also U20 Russian Vice-Champion (2006, 2007), U20 World Vice-Champion (2006), U18 European Vice-Champion (2005), U18 Russian Champion (2005), participant of the Russian Superfinal (2006, 2007) and he also qualified for the incoming 2007 World Cup. 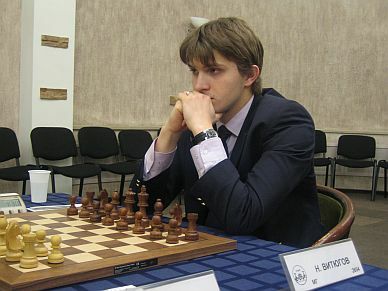 Chessdom: Hello Nikita, you were probably the highest rated untitled player before becoming Grandmaster. What was the secret behind your meteoric rise? Nikita Vitiugov: Hello, Goran. Indeed during the year of 2006 it was so. For many young Russian chess players it’s hard to get international title, because there are only few round-robin tournaments with grandmaster norm in Russia, and to win norm in a Swiss tournament is rather complex. Concerning my rise, I have been just working for the last three years, and of course, I had luck. Chessdom: You have just won the incredibly strong Russian Championship Higher League. What are your impressions from this tournament? Nikita Vitiugov: I am very happy that I was able to win this tournament. Though before the beginning, I counted on the qualification to the Superfinal, but during the tournament I understood that I could win. And after the game Rublevsky – Tregubov ended in a draw, I realized that I became a winner. Chessdom: Earlier this year you have qualified for the World Cup to be held next month in Khanty-Mansiysk. How far are you ready to go? Nikita Vitiugov: I will play game after game. Before the beginning of the tournament every participant has equal chances. Chessdom: You are young Grandmaster and already established author, your fantastic column on e3e5.com is very popular. Are you writing for other media too, are there any plans on writing books? Nikita Vitiugov: Sometimes I write articles for some sport newspapers or chess journals, like “64″, but regularly I write only on e3e5.com. I will think about writing a book in five years. Chessdom: There are only few good Grandmaster journalists, are you going to pursue this career? Nikita Vitiugov: I write for my pleasure and chess popularity. I haven’t though about my career yet. Nikita Vitiugov: I combine individual work with training with my coach, GM Marat Makarov. I don’t study everyday, but when I study chess, I study it hard. In my preparation I use Chessbase (7.0 and 9.0) and playing modules, like Fritz and Rybka. Chessdom: Are there enough good tournaments for you to play? Do you receive invitations? Nikita Vitiugov: Nowadays, I have only few good tournaments during the year, like the European Championship, the Russian Championship Higher League, and the Russian Team League, where I play for the “FINEC”. I haven’t been invited to any round-robin tournament yet. I hope that in the future this situation will be better and I will have more strong tournaments. 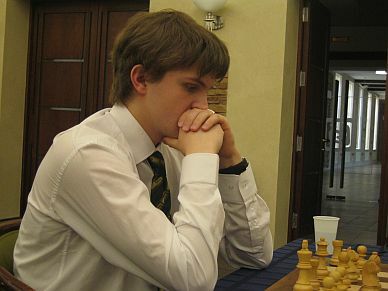 Nikita Vitiugov: I would like to say to the young players, love chess, enjoy the game, and believe in yourself. But don’t forget to study chess. Nikita Vitiugov: This year I will play in the World Cup and the Russian Superfinal. I will prepare for these tournaments, and try my best. Chessdom: What is your most memorable game? Nikita Vitiugov: The game from the Saint-Petersburg championship 2006 with Valery Popov is the most memorable for me. Nikita Vitiugov: Thank you for your wishes.